Anything compelling has to have a human element to it, but humans are inherently complex, and therefore unpredictable. The most successful innovations often seem counter-intuitive when they are introduced, but that's what can make them so valuable. So, if logic so often fails, how do you innovate and create brands, products, and services that people will connect with, care about, and value? In this talk, we take a cue from stand-up comedians: like brands, they have to consistently deliver fresh, innovative thinking that their audiences relate with. What lessons can designers and brands learn from the deliberately counter-intuitive comedy industry? 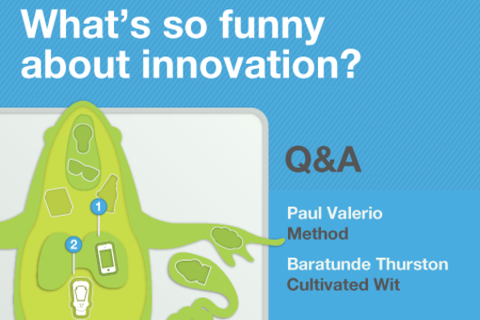 Join Paul Valerio, Principal at experience design firm, Method, and Baratunde Thurston, comedian and best-selling author, for a Q&A on comedy and how it can be used for brand, product, and service innovation. Baratunde is the co-founder of Cultivated Wit. He's also a comedian, author and former director of digital for The Onion. His responsibilities included producing the “War For The White House” 2008 election coverage, helping the company adapt its storytelling to new digital platforms such as smartphones and social media, and expanding The Onion’s public voice as well as relationships with the technology community. Baratunde is a best-selling New York Times author of How To Be Black. He regularly engages in “digital performance art” including being @The_Swine_Flu, running a real world campaign for his Foursquare mayorship and “live hate-tweeting” all Twilight movies. He’s been a standup comedian for more than 10 years and is a highly sought-after public speaker addressing topics related to the media, politics, technology and marketing. Also black people. He was named one of the 100 Most Creative People in Business by Fast Company magazine and has worked with the White House Office of Public Engagement as a digital advisor. Paul Valerio leads Method’s customer insights team in San Francisco, combining research and branding strategy disciplines to guide the creative process for Method’s clients. He has lead projects for clients within the cable and Internet TV, Financial Services, and Food Retailing industries. Paul is a branding strategy and market research specialist, with over 25 years of consulting experience for clients in retail, manufacturing, professional services, technology, pharmaceuticals, quick-service restaurants, and many other consumer and business-to-business categories. Prior to joining Method, Paul was the Senior Director of Strategy at Interbrand San Francisco, and ran his own consulting and branding agencies, Group 19 and Addwater, Inc. Paul has also directed branding strategy and market research projects at CKS Partners, Hi-Tech Communications, Landor Associates, amd Foote, Cone, & Belding Advertising. His clients have included everything from small start-ups to major Fortune 500 companies such as McDonald’s, United Airlines, Exxon, Sears, Fender Musical Instruments, and QVC. A graduate of Cornell University, Paul is fond of hiking the National Parks, and playing with his son and daughter. He is also cursed with a life-long devotion to the New York Giants.